People! use all available doors! The train is running every 3 minutes during rush hour, you don’t all need to get on THIS train!!! stupid train only comes every 7 minutes! why are all these people in MY way?! 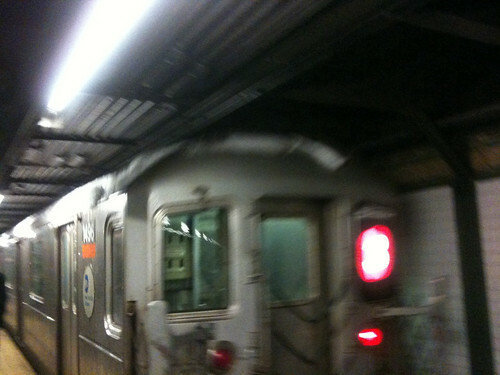 Even the best of us fall victim to… Subway anxiety? The crazy is endless. As a result today I made a conscious effort to slow down & smell the roses. I snapped a few shots which I’ll upload later. I can’t guarantee that I won’t blindly try to beat the crowd to the platform again but I didn’t today. Yesterday as I was watching the local weather report I heard the say that this year we have received approximately 4 times the average snowfall for the entire year. I know I am new to this but that made me really sad. The thought that next year might be a “normal” year and I won’t enjoy so much snow just sounded depressing. But then again perhaps by next year I will be immune to the beauty and romance affiliated with snow and see it the way almost every other New Yorker I know does. At first its nice but when it sticks and keeps coming they commiserate over the way it might hinder their commute, the dirty future it is bound to bear, the melting and re-freezing that inevitably happens over night leading to a slick sidewalk, the mud-like slush that accumulates in at street crosswalks and the hazards of walking under awnings covered in snow or worse icicles. Eh. who knows but for now the pretty snow is falling again. Today it’s even mixed with some rain but I don’t care. We are expecting 7-8 inches by morning so I’ll leave a little earlier, tuck my jeans into my boots and enjoy. This entry was posted in everything i've blogged, observations and tagged NYC, snow, subway, Train. Bookmark the permalink.